Each Decade Seems to Have a Different Dangerous Dog: What’s the common denominator? I happened across this on Facebook. The image makes a good point about the shifting historical conceptions of what are considered inherently dangerous breeds of dog. In the early twentieth century, Bloodhounds were considered to be a menace. There is one common denominator here. Following a spate of dog attacks on children – six in the last month, half of them by pit bulls or pit bull crosses – the government has promised to dust off ‘stalled’ dog control legislation. There have been predictable calls from MPs to ban and destroy all dangerous dogs and dangerous breeds. Local Government Minister, Nick Smith, has promised that a review will be completed in March of this year. The last law changes in New Zealand were made in 2003 and resulted in the outlawing of four breeds of dog: American pit bull terriers, Dogo Argentinos, Brazilian Filas and Japanese Tosas. Those already here must be muzzled on the street and kept behind fences at home. But these laws have been tried around the world and have been shown not to work. There are no inherently dangerous breeds of dog, only dangerous owners. The dog control officers have a saying: “Show me ten bad dogs and I’ll show you nine bad owners”. Anyone following these stories will notice that the dogs are almost always identified as Staffordshire or pit bull crosses. These are, indeed, dogs that were bred to fight and have a reputation for viciousness. It is this reputation and dangerous image that attracts the wrong kind of owner, those who see their dog as an accessory to their macho image or, in some cases, as a weapon. Yet owners who care for them well say that Staffordshires are among the most loyal and gentle of dogs if they are raised and trained well and, perhaps most importantly for their interaction with humans, are properly socialised with people and other dogs. 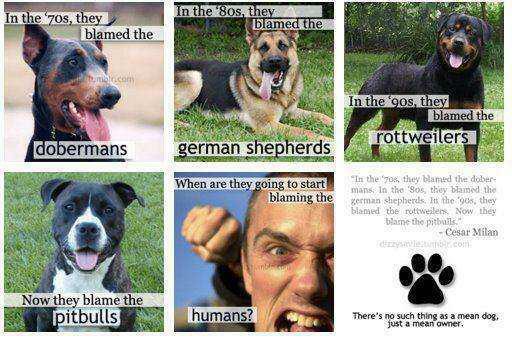 Nevertheless, it is the dogs that are inevitably blamed. But there is little consistency over time in what dogs are the problem breeds. In past decades, Rottweilers, Dobermans, German Shepherds, Newfoundlands and even Bloodhounds have been considered to be dangerous breeds. [T]he breeds most represented in dog bite data (1) vary over time, (2) are popular and (3) are not in proportion to their actual population. In almost all studies mongrels are the most common type of dog involved in attacks on humans. The variation in breed over time suggests that if specific dog breeds are legislated against, then another breed or type will be developed to meet demand for aggressive canines. No dog will be considered for adoption if we believe it may pose a risk to the community by virtue of behaviour, temperament or the … potential to cause serious harm or injury. The Auckland SPCA considers the risks associated with adopting pit bulls or pit bull crosses too high given the Dog Control Act declares them to be dangerous and we believe we have a duty of care to the community. So will law changes make much of a difference? How are they to be targeted? The Guardian recently published a piece on the ineffectiveness of the dangerous dog laws in Britain. In 1991, at the height of a tabloid frenzy sparked by a rash of dog attacks in England, the Major government passed a rushed piece of legislation which outlawed four breeds and made it an offence to ‘have a dog dangerously out of control in a public place’ – although the majority of attacks take place in domestic settings. Yet, the number of dog attacks has increased and there are more of the prohibited breeds on the streets now than before the legislation was introduced. Similarly in New Zealand, despite a toughening of the law in 2003, the Accident Compensation Corporation (ACC) has received 11,078 claims for dog attacks in the past year. This is a substantial increase from the 8,677 cases in 2003. Of the 2011 claims, 872 were children aged under four and 891 were for children aged between five and nine years. In Auckland, submissions are being taken on Auckland Council’s proposal to introduce a new dog policy and bylaw for the region – which will replace the seven bylaws and policies inherited from previous councils. The new bylaw, which should be in operation by October, includes making seasonal start and finish times for dog access on beaches and parks uniform across the city, neutering ‘menacing’ and uncontrolled dogs and standardising dog access rules for playgrounds, sports grounds, carparks, campgrounds and footpaths. I will write more on the development of this policy and the government review as they happen. I can’t help but feel that while there is undoubtedly a problem with the number of dog attacks on humans, a greater focus on owner reponsibility and training rather than simply banning or victimising particular breeds is far more likely to result in a reduction of these than current policy settings.